We should kick off this contest with very official opening introductions: Whereas May is National Barbecue Month; and whereas the upcoming Memorial Day Weekend unofficially signals the start of summer and the arrival of the grilling high season; we hereby present the 2016 Memorial Day Grilling Showdown. The idea here is simple. We got access to three brand new grills and had one week to cook on all three to find out which is the best purchase with warm weather finally embracing the entire U.S. and Memorial Day rapidly approaching. Of course, this was not a scientific study, but it was a meaty one. The stakes were high, and the steaks were medium. It’s a friendly exhibition. Please, no wagering. Char-Griller Duo 3-Burner Liquid Propane Gas Grill: ($399) Get enough would-be grill masters together, and it won’t be long before a “gas vs. charcoal” argument interrupts all of the drinking. The Char-Griller Duo eliminates the need for the argument by offering side-by-side propane and charcoal grilling pits and a separate gas range burner — packing three cooking surfaces that can sizzle simultaneously. 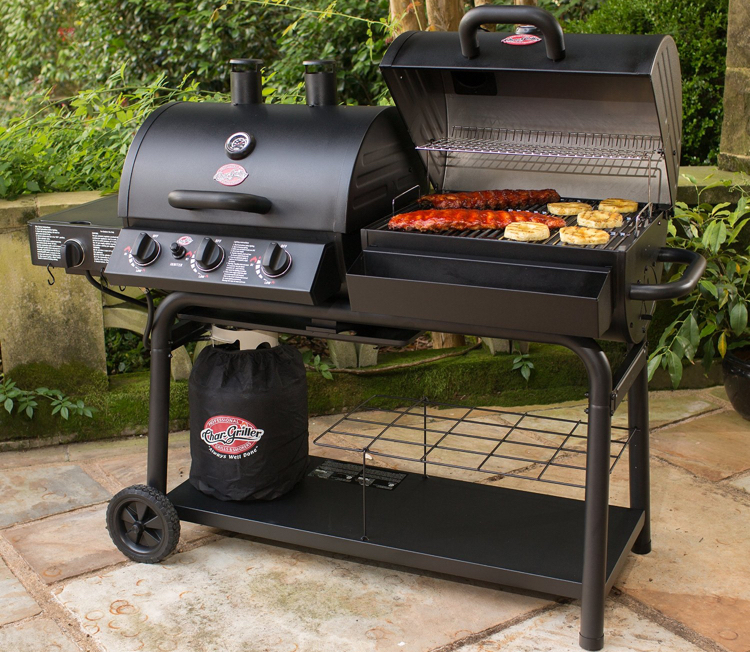 Packing a total 1,260 square inches of cooking space, The Char-Griller Dup also offers an adjustable grate the griller can rise or lower for temperature control a stainless-steel heat gauge, cast-iron grates and a removable ash pan. Char-Broil Gas2Coal Grill: ($299) The folks at Char-Broil took the propane and charcoal idea and made it more compact. This Gas2Coal switches from gas to coal in less than a minute by adding the slide-in charcoal pan which fits over the gas jets. Let’s say you’re mid-grilling and you run out of propane. You slide in the pan over the now dormant flames, add in a shallow layer of charcoal, and you’re back up and cooking as soon as the coals are hot. This Gas2Coal hybrid includes its own side burner, porcelain cooking grates and an in-built heat gauge. It’s great for decks, backyards or balconies with less available space. 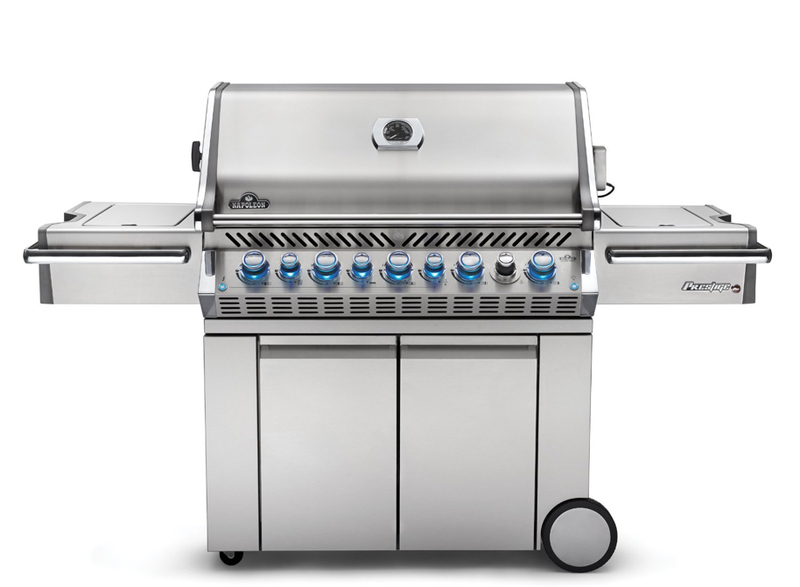 Napoleon Prestige 665 Propane Grill: ($3000) If this backyard rivalry was just about technology and overall features, this contest would be over and done. As its price tag indicates, this Prestige 665 is a professional-level piece of kit. While propane is its main cooking source, it’s equipped with multiple infrared heat sources and can fire up from 0 to 1800 degrees in 30 seconds. Weighing at 300 pounds out of its crate, the Prestige 665 offers eight burners, a cooking area of 1150 square inches and a total heat potential of 99,000 BTUs. 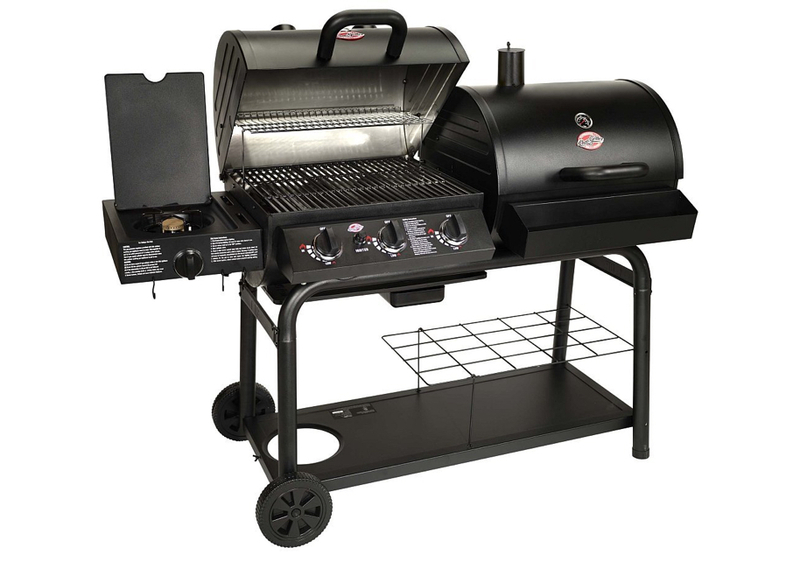 The grill allows for the griller to remain at the controls at all times with beverage holders, a marinade bucket and a cutting board. You can also use charcoal with it if you buy an additional attachment. I wouldn’t be surprised if it changes its shape and rushes off to fight Decepticons when you’re not looking. So, with all these three smoking contenders cooking pork shoulder to shoulder, cheek and jowl, who wins come Memorial Day? There is only one answer: The great American barbecue-loving public because there are going to be a lot of people with sauce all over their pusses enjoying perfectly prepared meat (…and vegetables, too. Fine…) off any one of these grilling options. After all this talk of fiery, though delicious battles in America’s backyards for who builds the best grill, we end up with a bit of a truce — a sort of “kumbaya” moment. All three of these grills absolutely get the job done, and there’s nothing negative to say about any of them. But, you can’t have three grills in your backyard, so how do you choose? It all depends on your grilling needs and your budget. 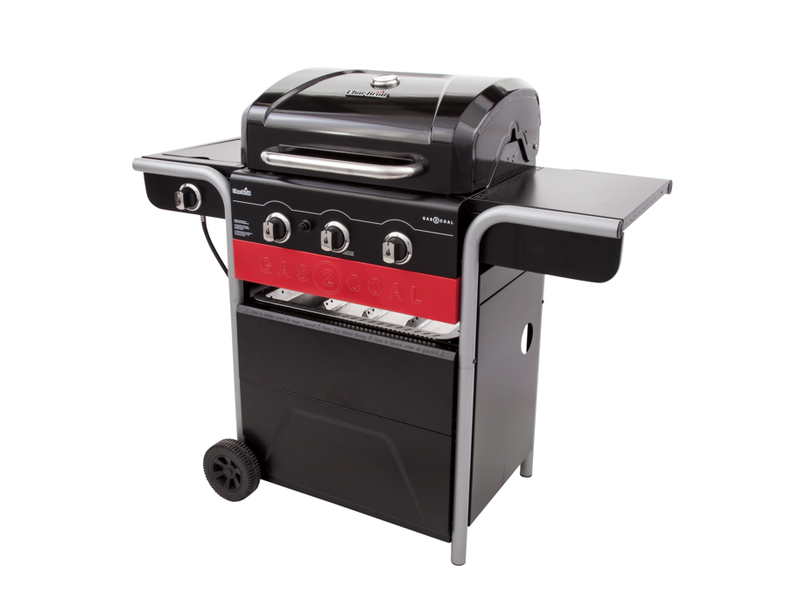 If you’re looking for the maximum grilling power and technological convenience, the PrestigePRO 665 can’t be touched. It’s an outright impressive machine. However, it is strictly a gas grill, so there’s no coal capability if you want to switch to old school. And it sits at that $3,000 mark. It’s a piece of serious kit for serious grill masters, but not a casual pickup for the yard. Both the Char-Griller Duo and the Char-Broil Gas2Coal options offer that charcoal possibility and share a price right between $400 and $300. The Duo offers the power of cooking over two fuels at once — essentially offering three simultaneous grilling surfaces in one, if you count the side burner. But, it’s big and demands open space for the grilling chef to work. The Gas2Coal unit is the smallest of the three, making it an easy fit in urban settings. And, while it can’t cook with coal and gas at the same time, it switches from one to the other with incredible ease. It’s also the least expensive. So, the buyer needs to survey the kingdom, check the coffers and weigh the choices. It’s a stress-free process because a guy can’t lose here. If he’s got grilling skills to put to work on any of these options, the eating is guaranteed good.